How Can Franchise Buyers get Great & Affordable PrePurchase Legal Advice? Richard Susskind has been writing for years about how technology will change the craft of lawyering from the production of specialized and unique legal consultation to scaled production. Some dismiss scaled production of legal products as mere "document mills". Recently, some Franchise Attorneys, members of the American Bar Association's Forum on Franchising, made a similar complaint about Legal Zoom. 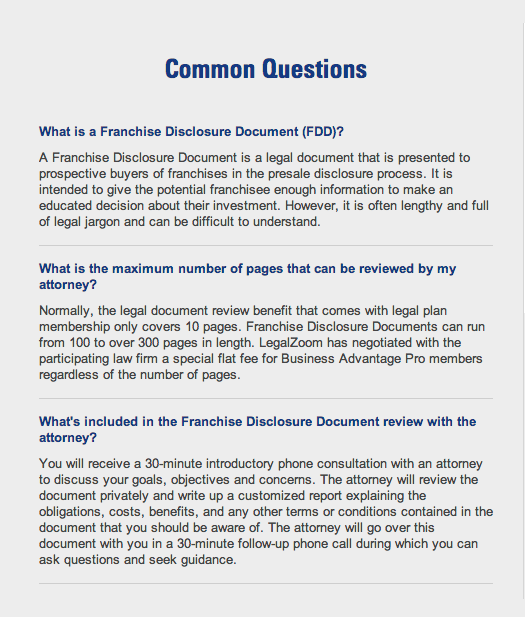 Legal Zoom charges its members $799 for a written review of the Franchise Disclosure Document, FDD. Many attorneys in the Forum felt that such a low price was not possible, and was a signal of poor quality. I believe that they could be wrong & they don't understand how legal skills can scale. This article is a short demonstration of how modern bargaining theory can help us see how we could scale legal products to benefit the consumer. How Does Legal Zoom Work? Can Legal Zoom offer a quality legal product at this low price? Here is a sketch of how it could be done. I am going to refer to the "Legal Platform" to make it clear that this article is not based on any inside knowledge of Legal Zoom's actual business model. It is based on basic bargaining economics found in the literature on multi-sided platforms -which is just a long word for devices which match buyers and sellers by adding other elements or parts. Legal Zoom may or may not fit what I am going to describe as the "Legal Platform". What do you get as member of Legal Zoom? What do you get for your $799? Here is the description from the Legal Zoom website. 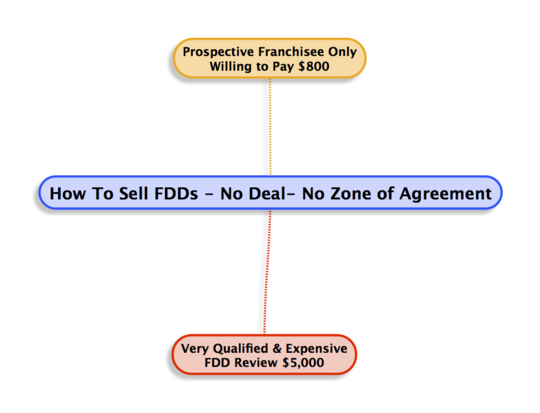 So, you get two 1/2 hour phone consultations and a "customized" report of the FDD, if you are a Business Advantage member. This level of membership will cost you a further $24.00/month. Now, it is difficult to see how a lawyer who is properly retained, and therefore under threat of sanction for professional negligence or misconduct, could afford to spend 10 or more hours on reviewing an FDD, charge only $799 & make any money in the long run. But, the trick to solve this economic problem to add attorneys, or types of attorneys. One whose retainer is with Legal Zoom and the other whose retainer is with the business advantage member. Let's how this might work. First, let's look at the bargaining problem. Here is a simple diagram of our problem. The buyer of legal information only wishes to pay $800, while seller will not accept less than $5,000. If you are very qualified & expensive attorney, it is natural to wonder if you could "replicate" your work by selling it over and over again to many new franchisee prospects. For example, if there were 7 prospective franchisees each wanting a review of the same franchisor system, then collectively they could pay $5,600 for a review. 1. Finding and coordinating all these prospects is a complex task - for which laywers have no special skills, experience or advantage. 2. The retainer problem is still present, and the liability for negligent advice has just been multiplied by a factor of 7. 3. It is not clear how you would deliver this legal product, and make it relevant to each of your 7 clients and still make a buck. Now, here is where the multi-sided platform idea helps. Instead of coordinating many prospects with one lawyer, we coordinate many prospects, with two types of lawyers, a non-specialist & the expert. Again, let's assume that we have a collective surplus of $5,600 from the buyers, and 7 potential buyers. Here is how the transactions could work. 1. The Legal Platform buys the FDD review from a very qualified & experienced lawyer for $5,000. This is a good deal for the specialist. 2. Attorney3 is non-specialist, and so are the other Attorney members. 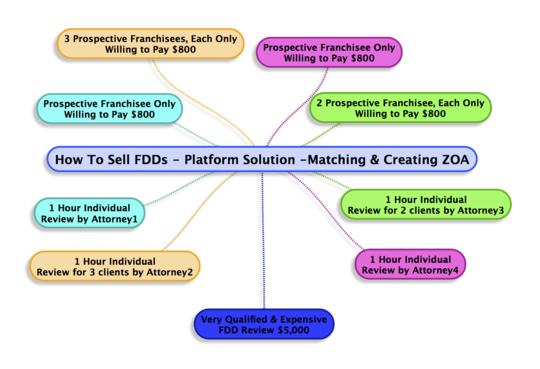 These are the Attorneys who provide the two 1/2 hour calls, take the information, and provide some customization to the very detailed FDD they purchase from the platform, let's say for $500 per FDD. They agree to limit their billing to $200/hr for the first hour and provide a 1/2 free hour. From their perspective, each transaction is worth $200, or 1 billable hour because they get $800 from the platform & have to spend 1 hour on the phone, billable at $100, and have to buy a FDD review for $500. So, as long as the customization doesn't take more than 1 hour, this is good deal for a non-specialist. 3. The Legal Platform also have members at $24/month, and this legal product can be marketed to them. The Legal Platform also has attorneys as members, who agree to certain flat fees in return for having their phones ring. But, if the Legal Platform can only match up 7 prospects with 7 non-specialists, it loses money. Only after matching 10, will the Legal Platform make money. 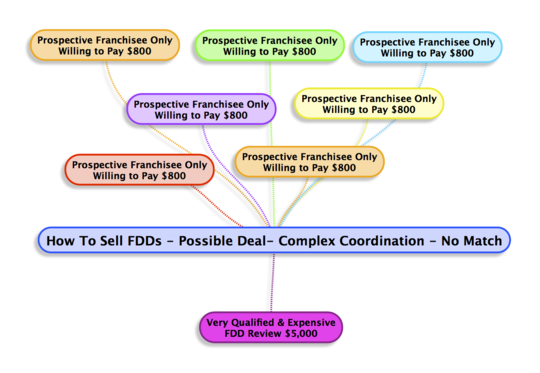 It takes on this risk and finds not 10, but 25 prospective franchisees. And then, everyone in the Legal Platform is happy. The members, the attorneys, and the Legal Platform have all conducted valuable trades - trades that would not be possible if the Legal Platform did not exist. If you thought this was useful or interesting, then you should sign up for my Newsletter on Bargaining. Just click here and Mail Chimp will take over. Thanks. Oh, and we never give out your email.